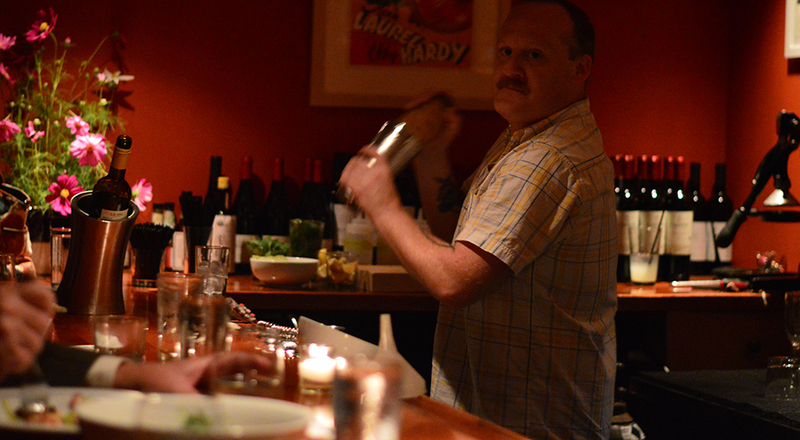 At long last we’ve tried Coco & The Cellar Bar in Easthampton. We rarely review a place after only one visit, but we had such a good time we made an exception. We’ll post a follow up after our next visit, which we’re sure will be soon. We met our friend Patty on a busy evening so it was pretty packed upstairs. Thankfully in addition to making some exceptionally-inspired cocktails, the full menu is available at the Cellar Bar downstairs. We can’t wait to return in the winter when the fireplace is in use. The space is as cozy and snug as a nice Irish bar: moody lighting, exposed brick, low ceilings, but all cheerful at the same time. The tap selection at The Cellar Bar is all craft and mostly local. I was happy to see one of my New England favorites that beforehand I’d only had in a bottle, Maine Beer Company’s Peeper. It’s got relatively low alcohol, which means a lightweight like me can enjoy a few without losing my legs. Its rich malty center supports 4 varieties of hops that pop but don’t overwhelm. Molly started with a bourbon-based cocktail special with fresh peaches and Cynar. While I enjoyed a second round of Peeper she tried The Coco Blossom, which is tarragon-infused white rum, elderflower, red apple syrup, and fresh lemon. She loved them both. 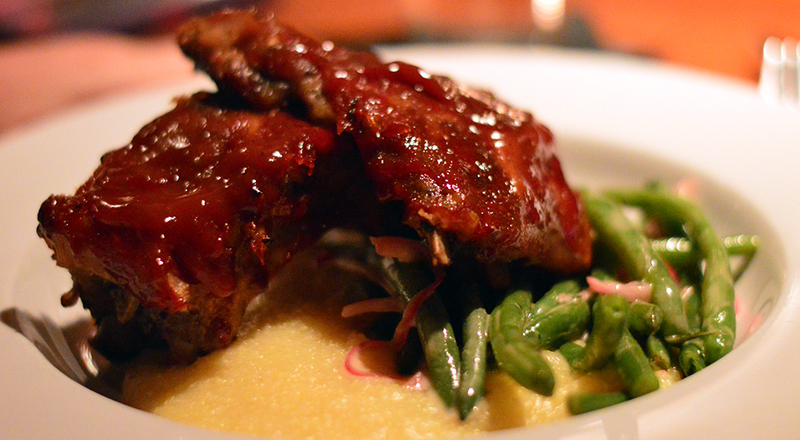 For dinner Patty had ribs with polenta and string beans. The ribs were fork-tender and the sauce was sweet, tart, and though not very spicy, was a keeper for sure. I thought the polenta was a perfect compliment to the sauce. 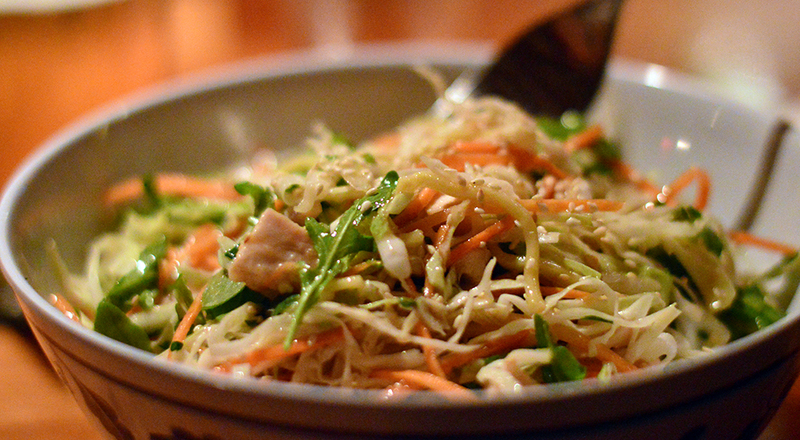 I had honey miso noodles with greens, roasted chicken, carrots, and toasted sesame seeds. It was better than what I’d been craving, sort of a top shelf version of the Chinese Restaurant favorite appetizer of chilled noodles. The sauce was both lighter and more flavorful than expected, which was a theme apparently if you go by Molly’s dish. 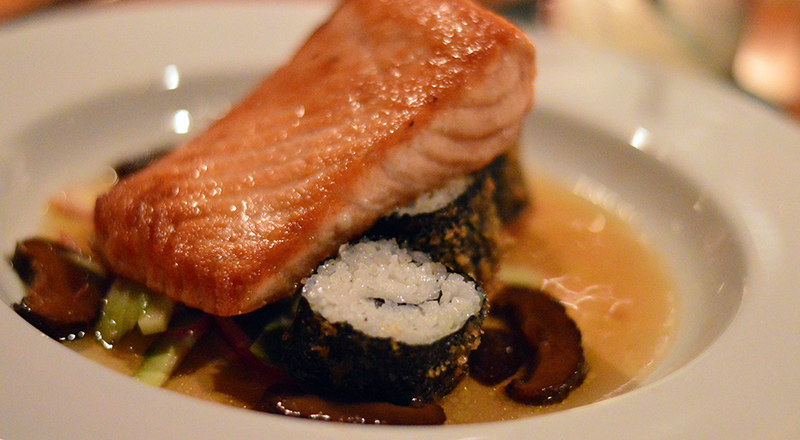 Molly had pan-seared salmon with tempura sushi, cucumbers, and pickled shiitake mushrooms. I’m not a huge fan of salmon, but this was my favorite dish of the evening. The little tempura rice rolls were delish and the salmon’s light sauce was impressive: delicate but with a wide and dramatic flavor profile. The tiniest drop imparted so much to everything. Stay tuned for more photos and reviews. We can’t wait for our next trip to The Cellar. If you like Peeper on tap they often have it across the street at Galaxy as well. Also you may be interested in the story of Coco’s chefs/co-owners. Unmi Abkin has a history in the area as the proprietor of some great restaurants (most notably Cha Cha Cha in Noho) and I believe she met her husband out in San Francisco after moving there. Then they came back to the area with their daughter and opened Coco. Many of us were glad to have her back!